As fat skis stormed the mainstream, even the most devoted zealots sacrificed performance on hard-pack in favor of Christ-like ability to float over frozen water. Fat ski disciples have proven their loyalty after years of wobbly slides for life across crowded groomers. And the ski gods have rewarded them with a slew of plump, rockered, twin-tip boards shaped with multiple sidecut radii that grip on hardpack almost as well as they float through pow. Boards also get lighter and stronger for the backcountry, in recognition of the pilgrimages that riders are making back to their roots. Having moved to Park City, Utah, Rossignol’s new skis reflect the increased opportunities to rip wild powder. Part of the Seven Artistic Sins (SAS) series, which melds urban art with innovative technology, the S7 Caballero (145/115/123) represents gluttony – the kind where you relentlessly stuff yourself with acres of unmarred backcountry. With graphics by Steve Caballero and direction from Sage Cattabriga-Alosa, it’s a twin-tip with reverse camber, reverse sidecut and traditional sidecut underfoot for cat tracks. Fibers in the core are aligned with the sidecut, so the ski is most dense underfoot. New to Palmer’s line are the P03 (117-85-117 in 171cm) park/pipe/jib ski and the P04 (132-98-124 in 189cm) fat, big-mountain twin-tip. Both feature Palmer’s proprietary FLF (feels like flying) shape with multiple sidecut radii for better power transfer across conditions. Light and wide, the P04 bridges the gap between resort and backcountry powder. Bucking the twin-tip trend, Karhu introduces four new backcountry skis, the Storm (128-96-117), Storm BC (128-96-117), Spire (122-86-108) and Spire BC (122-86-108) with flat tails for climbing skin wires and mountaineering anchors. The skis use Titanal 3 and Carbon 3 construction and Greenlight cores for torsional rigidity with reduced weight. The four-radii progressive sidecut is more aggressive at the tip and tail for better edge hold and quicker release. This year, Dynastar’s Legend Pro XXL (132-109-122) comes in a 187cm model, making it more accessible than when it was only at 194cm. The wood core now uses a strip of light Rohacell metal for more liveliness and less weight. The top sheet has less material at the tip and tail for additional weight savings. The Pro Rider models get new shape, construction and sizing. Built like World Cup race skis, with vertical side walls, wood core and two metal layers, they are 3mm wider throughout for more flotation and stability. Elan’s new partnership with Dalbello Skiboots has helped rocket their skis into the fall-line. Intense athlete involvement and new WaveFlex ribbed top profile, which isolates torsional and longitudinal flex, have also helped propel the company. The Fusion Integrated binding sheds 25% of its weight. Staying true to the old-school, Elan’s fatter, freeride skis, the 1111, 999, 888 and 777 are directional. Its four-model, twin-tip, freestyle line now fattens up with the new Pogo Holmes (136-107-126) for freestyle moves in big mountain power. Icelantic’s target market skis almost exclusively on twin-tips, so that’s all it makes. The company takes an unusual approach to ski design, making stiff fat skis for stable and “explosive” performance in all conditions, not just powder. This year, Icelantic offers the Nomad, Pilgrim and Shaman in longer lengths and introduces the symmetrical Da Nollie (118-88-118), a park ski specifically made for popular tricks like butters, nose/tail presses and ollie/nollie maneuvers. The flagship Scout and Soft SFT (soft version) are back unchanged. K2’s Factory Team line has five new, athlete-inspired twin-tips with unique taper angles to maximize backward performance. Vertical sidewalls make them impact-resistant, and some have a layer of Urethane under the foot for shock absorption. They have 3.5 mm edges (about 1mm thicker than most) to prolong their lives. The amount and type of rocker (upward bend in the tip or tail to improve floatation in powder) varies. The new ObSethed (138-105-125) has a 15/20 rocker, which is more relaxed than the Hellbent (40/40). The new MissBehaved (130-98-118) is a women’s fat twin-tip. Pep Fujas’ new ski, the Kung Fujas (125-95-120), performs equally forwards or backwards, in the park or out of the heli. The Disorderly (109-85-109) creates symmetry out of chaos, offering complete balance regardless of direction. Line gave birth to the new-school category twelve years ago, and they are still nurturing it as it enters adulthood. Eric Pollard’s ultra-fat twin-tip skis – the EP Pro (153-127-150), Sir Francis Bacon (142-115-139) and Elizabeth (142-110-139) – continue paving the way. In the All-terrain Freestyle category, Line stretches the Blend’s (132-100-122) waist width to 100mm for even more power float. One of the fattest skis in the freestyle category, the Blend is indicator of what’s to come. The Mothership (142-111-132) returns, resurrecting the Big Mountain category, and Line introduces two women’s skis, the Pandora (142-110-139) for powder and the 100% symmetrical twin-tip Shadow (110-83-110) for park. Movement’s not stopping, introducing eight new shapes, lengths and molds. The company acquired new factory machinery to produce its sustainable wood cores. The widest beast in the freeski category, the Goliath Sluff (134-99-118) will now be offered in 174cm length for smaller big mountain skiers. In freestyle skis, the Zoo (107-77-97 (in XS and S) and 114-84-105 (in M and L)) features sandwich sidewall construction to stand up to park abuse and offers more sensitive edge energy transfer in the snow and in the air. High Society Freeride emphasizes the elusive combination of light weight and durability in their new fat ski, the FR 187 (136-104-126) and park ski, the 177 (119-81-107). The FR line has a new weight-reducing top sheet, thicker edges and stronger base material. Scott created four new skis, three of which are twin-tip. All are chubby with dual radii sidecuts. The massive Stunt (141-113-128, 196cm only) and the Crusade (133-92-122 in 179cm) have Venturi tip and tail to lessen pressure on the snow when getting into and out of a turn. The Sheela (126-86-113 in 172cm) is a women’s twin-tip for the park and beyond. Also for the ladies, the Maya (116-76-106 in 165cm) is the only directional ski in the line. Last year, Volkl introduced its first rockered ski, the Katana. Then they set out to improve it. Their revelation was an elongated, low profile (ELP) that rises gradually in front of the binding toe piece and behind the tail piece toward the tip and tail of the ski. It preserves the speed control of rocker without sacrificing hard snow performance and provides enough height to float through powder, but not enough to compromise edge contact while turning. Volkl’s new fat, symmetrical twin-tip Chopstick (148-128-148) and its directional freeride Kuro (164-132-139) use ELP. 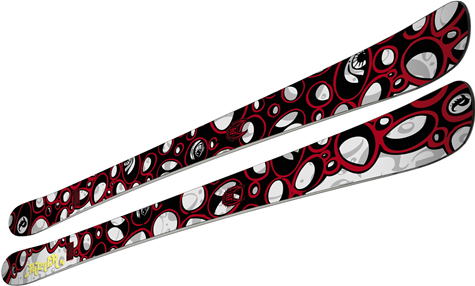 Women get two new skis, the backcountry jibbing Kiku (133-105-124) and all-mountain twin-tip Cosmo (130-92-112). Salomon expands it freeski line with three new powerful figures, the Lord (128-87-115 in 177cm), the Lady (128/86/114 in 169cm) and the Czar (128/108/118 in 174cm). The Czar combines rocker and a high twin-tip with a lightweight wood core, edge reinforcement and a huge waist width for flotation. The Lord and its female counterpart, the Lady, are big mountain skis with a smaller profile for better grip on groomers. Black Diamond’s high-voltage Megawatt (153-125-130) is electric in powder with a long rocker tip and a wood core for torsional integrity and stability in deep pow. Zero-camber offers predictable carving on firmer snow. A targeted park ski, Atomic’s Urban Punx (108-84-108) is completely redesigned. For durability, it features a Rail Slide Reinforcement edges and Ceramic Base Inserts underfoot. A special flex profile is designed for buttering and sketchy drop-ins. The Big Daddy (145-125-129) gets rocker in the tip and the Snoop Daddy (125-88-111) gets a turned up tail and a beefier waist width to make it a true all-around tool. In the name of increased durability and backcountry performance, Fischer gives its entire Watea freeride line I-bean construction, wood cores, vertical sidewalls and a tail notch for climbing skins. The Villain Pro (112-82-112), with 25-degree sidewalls, wood core and sandwich construction, is added to the slopestyle collection. The Addict Pro Team (110-78-103) is also added to the line at a parent-friendly price of $295. 4FRNT revamps its EHP Eric Hjorleifson big-mountain backcountry powder ski (129-116-123 in 186cm), adding a 179cm length and zero cambered gradual radius tip and tail curves. The shapes extend as deep as 40cm in the tip and 20cm in the tail for a short, flat and wide running surface. The ski is made with sandwich construction and the graphics were created by Eric, inspired by Molson’s Pilsner Old Style Lager.